In an interview on the film's official website, director Terence Davies was asked who the audience for this film would be. Characteristically, he selfishly claimed it for himself. Any half decent director makes films for their own pleasure and just hopes they make a connection, at the right time and with the right audience. Personally, I would hope he made this film for someone like me. I'm from a relatively poor background but my hardship was certainly not as intense as that endured by Davies. My parents both originated from Liverpool and I have numerous relatives scattered around the city. So, naturally I'm likely to be the target audience. Jarman's acidic excoriation of Thatcher and Davies rejection of a Liverpool mired in the sentimental cultural club foot of The Beatles makes them both Little Englanders to the nth degree. Davies eulogy, for that's really what it is, is not just for a vanished Liverpool, and by association a particular working class pride born out of the hardship he describes, but it is also for a Britain that's changed out of all recognition since 1973 which was when Davies left Liverpool. What struck me about his often hilarious and bitchy attack on the monarchy in 'the Betty Windsor show' and his lament for an England lost to over-development, slum clearances, the affects of war, and the lack of support for inner cities and their communities, was its similarity in tone to the equally superb dissection of the ills of modern England carried out by Derek Jarman in The Last Of England. Jarman's acidic excoriation of Thatcher and Davies rejection of a Liverpool mired in the sentimental cultural club foot of The Beatles makes them both Little Englanders to the nth degree. I would argue that both directors, whilst in raptures to the past, are both keenly aware that time moves on even if Davies attack on John, Paul, George and Ringo ('a firm of provincial solicitors') is rather too snobbish. But it is all the better that it is his personal vision with which we can argue and that is nowhere more evident in the long section which features archive from the late 1960s and early 1970s were he grumpily swipes at a generation and perhaps accuses them of not being as high-minded as him. But his vision is so painfully radiant and charged with emotional loss. There are two sequences in the film that reduced me to tears. One is archive footage of local children out playing in the streets. He brilliantly mixes their playground songs with a stunning piece of Mahler. Yeah, Mahler. Sounds sodding pretentious, doesn't it? But by God, I was transported back to the halcyon days when kids, just like me, could play out in the streets and roam like free spirits without the moral panics that today's generation are saddled with. I was crying for a lost innocence. Peggy Lee singing 'The Fools On The Hill' over footage of slum clearances and communities dispersed into brutalist high rises is the core of the film and Davies' eulogy. I immediately recalled how as a family we moved from our little three bedroomed semi, when I was 20, to a grim council estate. 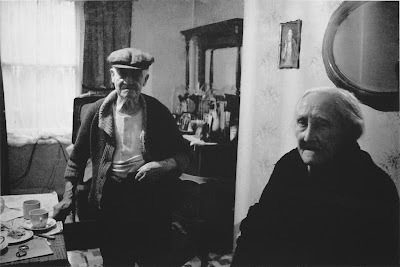 That estate destroyed my family and severed us from the vital connection to overbearing but good intentioned neighbours and regular visits from dotty relatives and cousins. Within a year my mother was dead and I was estranged from my father. Seeing that footage of such severe communal disintegration set off all these associations. That's the power of cinema. It's wildly appropriate that the film gets its release in the same week that a tide of Little Englander outrage has descended upon the juvenile disrespect of a younger generation. I guffawed throughout the film at Terence's rather fruity and sarcastic delivery. His mellifluous voice-over is central to how the film works. It takes you into the Terence Davies mind space, where a heavy emphasis on 'Queen Of The South' at the end of a tale about his brother listening to the football results on the radio is pregnant with all manner of gay innuendo. His riposte against his Catholic church upbringing is highly evocative as he describes it as a huge con - 'years wasted in useless prayer' - and his burgeoning homosexuality, then illegal, is caught in the hypocrisy of Round The Horne smuttiness whilst he tells an anxious tale about two gay men being arrested in the local area. The anxieties of being a closeted homosexual are no better illustrated than from his romantic pining for a school friend who had occasion to put his hand on Davies' shoulder to a ribald swooning over Saturday afternoon wrestlers sweating in their tight trunks. The film is full of poetry and other annotations, everything from Eliot, Engels to Chekhov, that highlight Davies' vacillations between the good old days of the slums and the face lift of today. It's wildly appropriate that the film gets its release in the same week that a tide of Little Englander outrage has descended upon the juvenile disrespect of a younger generation. 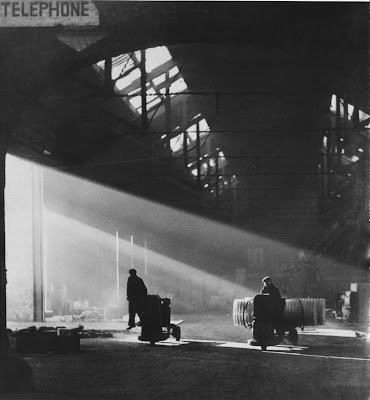 There is a whiff of that in Davies' film, and a somewhat pompous view of what constitutes high culture, but it's very clear he loves Liverpool and England and knows full well that the slums weren't the panacea for all ills and that life was extremely hard. Like all Little Englanders (and I include myself in that bracket), he's feeling a deep and aching sense of loss and an alienation from a modern society and an altered landscape in which he no longer knows his true place. Time has passed for Liverpool and he laments its passing. It's a fine, relevant and timely eulogy. Humphrey Jennings would be proud. 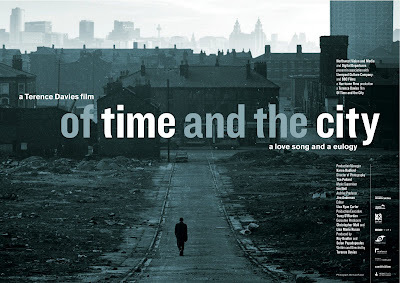 Of Time And The City website with video interviews and press reviews.